The impeachment committee has been named in congress and the proceedings should begin shortly. Lula was sworn in on March 17th as Minister and Chief of Staff, but shortly thereafter was banned from the ministerial role by the Brazilian Supreme Court alleging that the nomination was designed to shelter Lula from prosecution on money laundering charges. The Car Wash has another series of raids this week as the domino effect continues. 3 months ago I would have put the chance of impeachment at less than 25%, but now I would say there is a higher than a 70% chance she is impeached or removed from office. How times change! Down to business however. 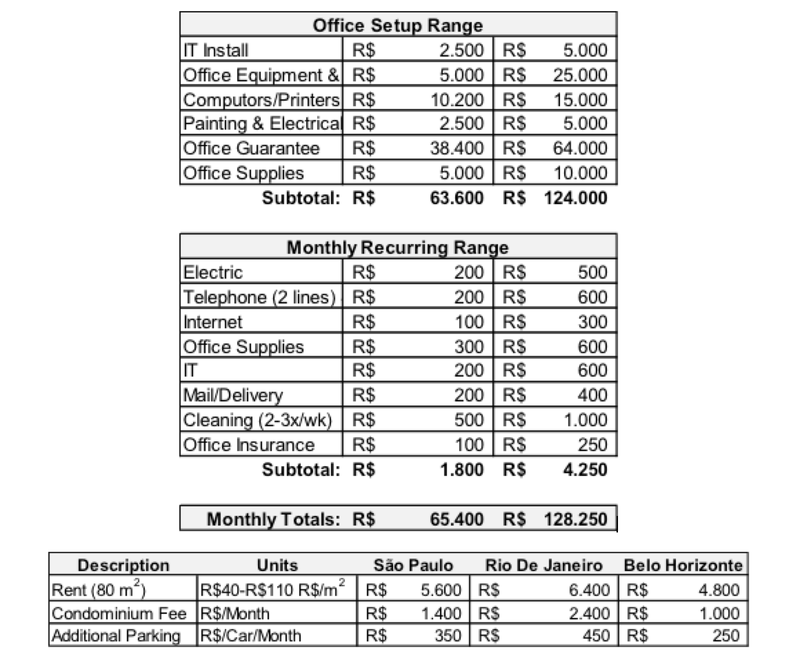 This next entry in Doing Business in Brazil 101 looks at how to and how much it costs to open an office in Brazil. 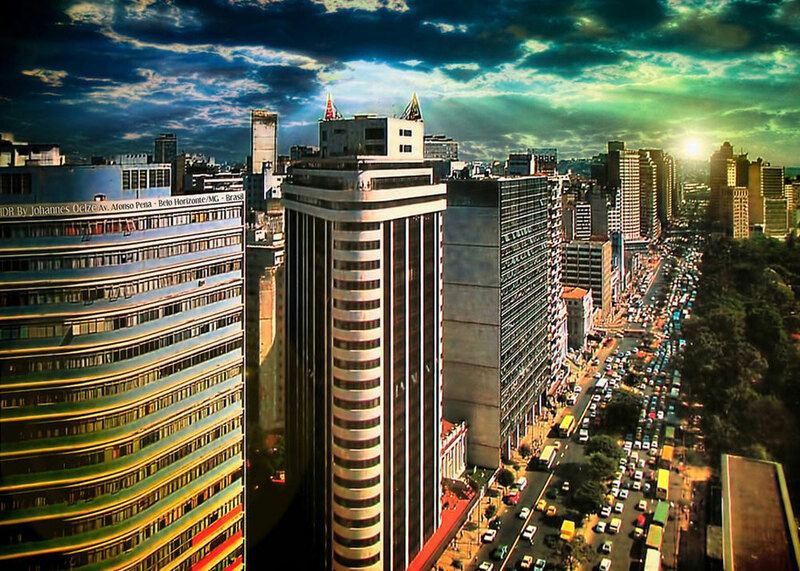 Renting an office is like leasing a car, and a lot will depend on what you want. As the old proverb goes – you get what you pay for. If you want a really swank office in the business center to impress your clients, it’s going to be one level of expense. If you want a middle of the road offering in a safe neighborhood, it’s going to be a bit different. For this entry, I’m going to focus on opening a small business office for 6-8 people in the principal business centers of BH, São Paulo and Rio de Janeiro. This will be one of the most important considerations, especially depending on which city you choose to set your company up in. We can talk more about this in future posts, but for now it’s important to think about the image you want to project, plans for future growth, proximity to suppliers and clients, ease of access, parking and safety. If you want to set up business in a city like São Paulo or Rio, the friends that I know that have the best quality of life live, work and have their schools/activities all within a couple kilometers of one another because traffic is so difficult. Parking – always a challenge because most buildings barely give parking a consideration and few provide visitor parking. My suggestion is make sure your office has good connectivity to public transport and has a parking lot near the office. Safety/Security – another big concern. Anyone can be robbed at any time at any place, but you don’t want to set up your office in an area that has an above average level of crime incidents. Make sure the building is secure, has security and accesses are well lit and monitored. Access – employees, clients and suppliers need to be able to easily and safely get to your office and conduct business in a pleasant environment. If you can walk to work, even better! Support services – its really nice to have banks, a cartório, post office and restaurants nearby. The cartório is the true gold mine in Brazil. Almost all official documents have to be notarized, so its nice to have nearby. Also, hopefully have a good choice of restaurants nearby for lunch. People eat out for lunch so the more options nearby, the better. You can find anything you want from Class A buildings to executive suites to co-working spaces, depending on your needs or budgets. Older buildings in Brasil are typically less flexible because traditionally they were divided into small offices of 20 to 60m3 each with its own toilet and wash room. If you wanted a couple hundred m3, it was common to have to separate your team into several of the smaller offices. Not great for teamwork or communications. While it was less common to find big, open floor plans, that has changed more recently. Newer buildings are more open, and can be subdivided on the build-out if you choose. Just a cultural aside, in general North Americans always look forward to having an office with a door, but not so in Brazil. It’s a very social culture, so keep that in mind in figuring out what your office space should look like. Ask your people what they want and come to a consensus. Again this is a very subjective item depending on your company’s preference, but important to keep in mind. Parking in Brazil is a pet peeve of mine. There isn’t any that you generally don’t have to maneuver 12 times in to get out of and god forbid you drive something other than a Fiat 500 or a Mini. There is usually a very limited number of parking spaces with each office, so check into and see what the alternatives are. If spaces are tight, you may not even be able to rent spaces in your own building. Connectivity is mission critical for business today so getting reliable phone and internet is high on the list of things to check on. Keep in mind that even though there maybe fiber optic on your street, which is not always the case, the building may not be wired to take advantage of the increased bandwidth. Older buildings typically have this problem, although newer buildings are also not guaranteed to have. Make sure you check! Unfortunately, DSL is still the standard for small offices because of the current infrastructure. Fiber optics is just starting to roll out as a more common service. Also, reliability is always an issue. We lose connectivity at least once per day, but upgrading is just not even an option for where my office is located. Contracts are usually for a year and then roll over to month to month. Keep in mind that many times there are much better deals if you have the same service provider across platforms. So for example, we have the same service provider for office landline/internet as we do for my cell phones and my personal home phone. I can call for free as long as I am calling to anyone with the same provider. Also give yourself plenty of time to get the service turned on. Very rarely do things go according to plan, so build in a bit of flexibility into your go live date. I have one of the main telecommunications companies provide the landline/internet in Brazil, and they have a guaranteed amount of time to get me back up if service goes down. I also have an international VOIP service so that I can make and receive international calls at a fixed monthly rate. Plug the box in the wall and you are off to the races. Office equipment and furniture again varies a lot depending on tastes and business purpose. Costs will depend on the impressions you want to project and your budget. It helps to shop around because the prices and quality will vary greatly. When we purchased office furniture, we checked at about 6-7 suppliers from big box stores to smaller local providers. In the end, we bought from a smaller, local supplier because they had the same furniture as the big box store at about 30% less, and I was able to negotiate a significantly better deal on chairs. Just remember there is a big, big difference in quality from high end to low end. In Brazil there is a very, very, very low end quality level that isn’t even available in North America. It’s definitely less expensive, but at the end of the day, requires constant maintenance and falls apart or stops functioning quickly. In my humble opinion – not worth it. Offices typically come completely empty right down to light fixtures, window shades, AC, and even toilet seats. So budget and be prepared to buy everything you need, and if the office you rent comes with something, then it’s just a bonus. As far as a workspace, remember you need to provide a place for employees to lock their personal items while at work. So we bought a desk, chair and roller drawer that locks. Also remember to outfit a small kitchen area (copa). We make a regular, monthly purchase of office supplies, and it typically gets delivered by mail in a couple of days if all the items are in stock. In general, buying products on the internet is cheaper, and you can set up an account where you can get billed monthly. If you can schedule your purchases, it’s worth the effort. Just make sure you review the invoice at the time of delivery and confer that everything you ordered is there. Prices on mail order supplies are usually pretty competitive from store to store, and you can always negotiate bulk discounts on regularly purchased items like printer paper for example. I recommend having two or three suppliers in case something you need is out of supply, but we also have a local office supply store that we can always run to in case of emergencies. We buy kitchen supplies/drinks/food from the grocery store right down the street. Finally, we get bottled water delivered to the office for drinking. Getting wired up is an adventure. We have had very good luck getting network set up and maintained. In general, the install is very good, but again give yourself a little bit of flexibility in go live date, because it always seems to come down to being dependent on phone/internet company, which rarely delivers on time. Secure that network because criminals are very, very inventive. Prices on most office electronics have become very competitive, and you pay a bit more than internationally. But, many times you can’t get the latest and greatest, or if you can, it’s going to be very expensive. I have intentionally avoided using specific names or brands in this article, but as far as computers go, do yourself a favor and just call Dell and get what you need. It’s got the best selection, stand by their products and has ok customer service in case thing needs to get replaced or fixed. One stop shopping and convenience mean a lot to me. Printers are a mixed bag. I have looked into renting printers/copiers and just paying a price per sheet as well as buying our own equipment. At the end of the day, the rental option is nice, but expensive. You basically buy a new printer every 10-12 months depending on volume. On the flip side, if there is a problem, they show up, drop of a new one and take the old one away. I have had to have the printers serviced, and its slow, expensive and usually mediocre. If you have volume, probably better to lease, but if you don’t print a lot, then probably better to just buy your own. I recently bought a brand new printer and started having troubles within a month of getting it. Remember that return policies here are very mediocre and usually within a short period of time, the store you bought your stuff from doesn’t want to hear from you. Then you will be dealing directly with the manufacturer. Good luck and be persistent. It took me 5 weeks to get my printer back fixed. I have a spare just for such occasions! Ink is the usual highway robbery that it is worldwide so no change here. I do Amazon order the XXL size black cartridges and bring back a couple with me every time I travel. I am a fan of cloud storage (see next section). I have automatic backup to local hard drives, but also have offsite encrypted cloud backup just in case. If something happens, you can access your files from any computer and be operational the next day if required. Think carefully on the term of your lease. Most times they will try and tie you into a 3-5 year lease renewable for another 3-5 years. Try to negotiate a no penalty exit clause after 12 or 24 months just so you can keep as much flexibility as possible. We were able to negotiate a 12 month lease and then month to month thereafter. Most buildings require you to have a guarantor to underwrite your contract or you have to buy an “insurance policy” to cover this requirement. Finding a Brazilian resident that owns a property free and clear in the same city that is willing to sign as a guarantor for you in case something happens is without a doubt the cheapest way to go. But, good luck with that especially if you are just starting up here. The alternative is to buy a type of insurance where you give a deposit of approximately 6-10 months of rent to an insurance company, and then they guarantee your lease. On paper at least you get a small interest rate on that money sitting there, but in practice you will be lucky to get your principal back. There typically is an once a year window where you can tell them that you are out of your lease and get your money back, but other than that there are fees and penalties that can take a good chunk so you get 50-70% of your original money back. Cost of doing business. Get a reasonable insurance policy on your office so that you can get back up and running if disaster strikes. I’ve had friends whose whole office was cleared out of electronics over the weekend. The insurance is fairly nominal and allows you to get back and running within a reasonable time. The Correios are all over, and you can get 1-2 day “guaranteed” air delivery to most of the main capitals and large cities. But, I never put anything in normal mail if I’m worried about it getting there. Even the guaranteed air delivery sometimes fails, so try to avoid having to send contracts or docs that absolutely have to get there overnight. For international delivery, FEDEX and DHL are available. FEDEX is right down the street, and we have an account. Also you should consider a motorbike delivery service. When we need to send something across town or get something picked up and brought over, they are the best. They will stand in line for you and handle all the red tape that sometimes there is no way of avoiding. They can charge you by the trip or per month minimum and then anything over the minimum has a preferred rate. Getting the office cleaned is usually done by the day or by the month. We have a person who comes in 2x a week for about an hour and gives the office a general cleaning. Depending on how big your office is and how many employees you have, you may want to hire a full time person. If you hire on a daily basis you generally pay a daily rate plus bus fare. If you have them come every day then you will have to hire them CLT and pay a monthly salary, benefits along with lunch and bus service. IT support is another service typically covered by a monthly contract. We have an IT person come in once a month, and provides offsite support as needed. If they need to come for something else, then they just charge me a service call based on an hourly rate. Again, your needs may vary, but it pays to shop around. Prices, quality and response time vary a lot. So there you go. Something to get you started on your entry into Brazil. If you need help, let us know.